This is a 5-day introductory course for beginners which results in being awarded with the Certificate Qualification in Raynor Massage. New students will quickly learn the skills necessary to effectively massage clients and help them with their healing process. The classes are small with no more than 20 students under the tuition of Dave Taylor. With such personal attention and supervision, this intensive course is an extremely effective way to begin your training in Raynor Massage Therapy. How Do We Teach Raynor Massage? Our method of teaching is hands-on and every day you will be watching, receiving and giving massages. We don’t believe you can learn the necessary techniques from reading charts and diagrams and there are no written exams. We show you how to recognise tension in the muscles by feeling it, and how to track it to the exact location where it is being held and the techniques needed to release and relieve it. This is exactly how massage was taught for many centuries before massage became “medicalised” by institutions that had no real understanding of the healing power of touch and intuition. The course is perfect for beginners as you will be guided every step of the way by Dave who will always be there to oversee and offer advice. It is Dave’s responsibility to ensure that you are performing Raynor Massage correctly and to also empower you to develop your own skills. Every day you will observe your tutor demonstrating the technique throughout the massage training. You will receive massage and massage other students from the very first day of class. You will be partnering up with other students and be given opportunities to work on a variety of people & “problem areas”, which prepares you to deal with a whole range of people presenting all sorts of issues once you complete the course. The five days of class are very intensive and usually runs from 9:00 AM – 5:00 PM with a 45 minute to 1-hour lunch break. Massage training that is suitable for complete beginners. You don’t need any prior training or separate massage qualifications to participate in this Certificate Course. So students can enroll on the course with no background or experience in practicing massage at all. Looking to retrain or ‘upgrade’ your massage skills? People in the UK are looking for a different kind of massage and are no longer content with a superficial, soft treatment that sends them to sleep. Clients are demanding that their therapists work on a deeper level then before to effectively eliminate tension. Therapists who have not been properly trained to massage on a deep level will often find themselves injured, suffering from RSI, sore thumbs and damaged wrists. 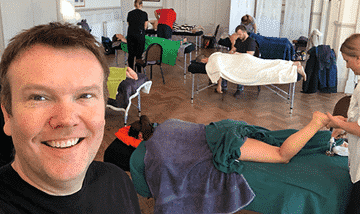 Dave Taylor is passionate about the welfare of therapists and will teach you how to safely give a really deep tissue massage that clients will love whilst allowing you to have a long career. There is a lot of emphasis during the massage training on correct posture. 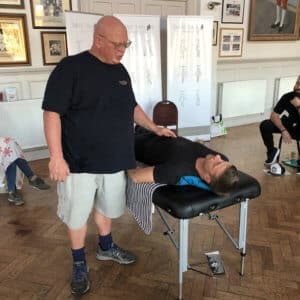 Dave will share with you techniques that utilise your entire body weight to provide the power behind the massage so you are not solely relying on using your thumbs! 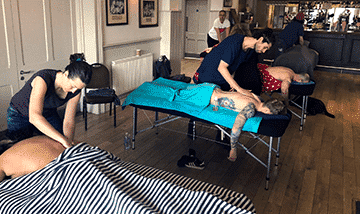 Students enrolling on the course who already have been practicing massage will have gained hands-on experience and confidence working on clients’ bodies. However those having no prior experience in massage also have an advantage in that they won’t have to unlearn anything as they begin using the techniques unique to Raynor Massage. Dave will begin working with you based on your own experience, whether this is your first exposure to massage or if you’ve been practicing massage for years. 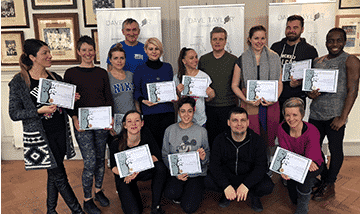 By the end of the 5-day course we expect that you will have developed the skills needed to give an effective Raynor Massage Treatment and Dave will do everything to support you in that endeavor. Raynor Massage therapist will learn that holistically the body, mind and spirit are interconnected and how residual tension builds up in the body when these aspects are out of balance. Raynor Massage also seeks to open up the meridians or energy channels that prana or chi (life force) flows through. After having this type of massage clients feel relaxed in body, mind and spirit, rebalanced and renewed. 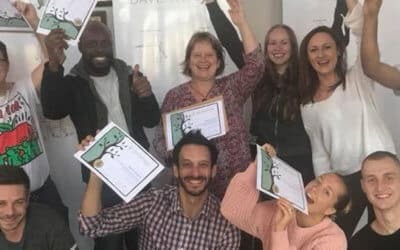 During this short but intensive course, you will learn the fundamentals whilst also receiving this holistic and powerful massage technique aiding with your healing journey. So what exactly is Raynor Massage & is there a demand for it? Raynor Massage is a unique method of massage specifically focusing on finding and eliminating residual tension being held in the body. Brandon Raynor developed the technique based on over twenty years practicing massage and studying many different techniques used throughout the world. He has developed a method of teaching massage that enables students to learn quickly, focusing on the goal, which is always finding and totally releasing all residual tension located throughout the body. Our bodies hang onto tension in our muscles for a variety of reasons; poor posture, stress from home or work, injuries, exercise and/or sports training, hunching over a computer and other things as well. This tension is held in our muscle tissue and eventually results in residual muscle tension and pain. If this goes untreated for any length of time it can result in long-term problems physically, mentally and emotionally. As a trained Certificate Level Raynor Massage Therapist you can market yourself as being a ‘Deep Tissue Massage Therapist’. You will also be able to treat sport related injuries. You can help people become pain free by releasing built up residual tension in their muscles as well as the emotional tension that may be the root cause of the muscle tension. The morning session will start with a group workshop demonstrating massaging the neck, head and face. There will then be another massage demonstration on one of the students showing everything from the previous days and including the front of the legs, neck head and face. After lunch the students will once again pair up and swap massage trying out all the techniques taught so far. Was inspired by many traditional Eastern treatments and works using the principal that different aspects of the body are all connected. Which means you treat the body as a whole. Is suitable for complete beginners without any previous massage experience or for already qualified therapist who are wanting to upgrade skills and offer their clients this fantastic technique. This course also includes a ‘Business Workshop’ to ensure you have all the required knowledge to get your business up and running. Dave shares with you exactly how he got his successful business established. 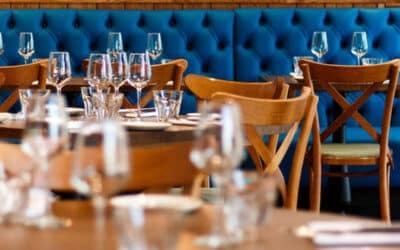 We run daytime courses that run Monday to Friday, 0900 till 1700 in our London and Dublin locations. We offer the all-inclusive retreat course over 8 days in North Devon. Graduates of every level of our training courses are eligible to be covered with Full Professional Indemnity Insurance. Once you have your insurance in place you can start massaging professionally. “I went on retreat with Dave to learn Raynor Massage in 9 days. Dave was professional, charismatic and humourous. A man who is sharing his love for massage. I enjoyed the training which was hands on from the first day. We all gained great confidence very quickly under Dave’s guidance. The technique is very effective! I can personally confirm that this training will leave you feeling empowered with a new life skill. "I found Dave's teaching methodpretty ideal. Always very enthusiastic and passionate about the method, very friendly and genuinely happy to share knowledge to help us improve"
I'm a Personal Trainer who wants to offer my clients Sports Massage. Is this the correct course? Yes! I have helped many Personal Trainers achieve this already. They find that my course is perfect as they are able to get their massage qualification quickly with the 5 Day Certificate Course. Raynor Massage, the style of massage that I teach is also superb for those seeking a deeper, Sports Massage style of treatment. Feel free to call me direct on 07979768269 for more information on this. Do I also need to take a course on Anatomy and Physiology to become a Massage Therapist? There is no requirement at all for you to have any separate qualifications in Anatomy and Physiology to run your own business as a massage therapist. Some people think you need this to get insurance but it’s not true. The Professional Indemnity Insurance companies don’t require you to have A&P either. Most A&P course are filled with information that has no relevance to being a fantastic massage therapist. For example its not necessary to memorise the names of the muscles in Latin as most courses require. I'm not confident about running my own business, Will you help me with this? English is not my first language. Can I still do the training? I’ve helped many students from all over Europe who don’t have English as a first language get through their training. Sure, its important that you have reasonable English language skills but it’s not essential to be fluent. So much of the training is practical. Also, I can also send you all the course material in advance to give you a chance to read and translate. Will I get a job in a Salon with the Certificate Course? This is a tough one to answer. It really depends. The main thing you need to find out is what requirements the Salon has for their employees as they are different; Some are happy just to assess your massage abilities and ensure you are insured. Other employers want you to have taken a more academic approach to training, for example, having an ITEC. Most people who take my course are wanting to work for themselves, earning their own money and getting their own clients. If this is what you want to achieve then I can absolutely help you with this. 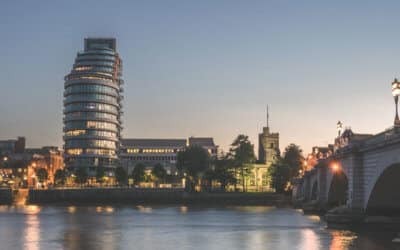 I don't live in London or Dublin but I want to do your training, What do you suggest? Oh the majority of students in my class do not live locally. Some travel from within the UK or Ireland and others travel further. I’ve even had students travel from America and Dubai to do my training. The course duration is just 5 days so you can get a local Hotel or Airbnb. For example, when I travel to London to teach I book the Premier Inn and it usually costs around £170 for 5 nights if I book early. This Hotel is just 10 minutes walk from the training venue. Alternatively you might want to consider the Retreat Course in Devon which has all accommodation and meals provided.